Book "The Stay and Escape Package" with DoubleTree by Hilton and receive an exclusive rate on an overnight stay, an escape room with a champagne welcome, overnight parking, and breakfast for 2! Give the gift of an experience! 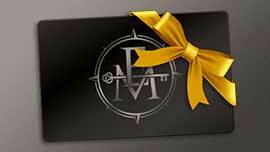 Escape Manor gift cards let you gift an adventure when new socks just won't do. You and your friends are starring in your own themed adventure. As the clock counts down, you use logic and teamwork to find clues, solve puzzles, and escape before time runs out! We look forward to locking you up! Keep reading to see our rooms. “Alex... Alex?” You look to your friends—their faces gripped by fear. “It's just a silly game” you thought. “A rich deep and blo”—the winemaker paused—“a deep red wine. Full of bod”—a second pause—“full bodied with wonderful flavors. Now, shall we begin tasting?” With a wry smile, the winemaker opens the cellar door. One assistant after another seemed to "vanish," and you're here to uncover the truth. As you snoop around the studio, panic mounts. The magician is planning a grand finale. Will you escape before the show begins? An unknown virus has devastated mankind and we now stand on the brink of destruction. Within this military base lies the cure. Infiltrate the base and find the cure before nothing remains of the living. Go VIP! Sign-up to get deals, first dibs on new rooms and events, and be in the know for all things the Manor. Bachelor parties, team outings, birthdays, corporate events, even proposals! Escape Manor is the perfect venue to handle any and all of your entertainment needs. Escape Manor has hosted some of North America's most recognized brands such as Shopify, Bank of Montreal, TD Bank, Ottawa Senators, The PGA Tour, Cirque Du Soleil, and Members of Parliament for superior team building, coaching, and social functions. There is also no better way to start your bachelor/ette party than getting locked up together! No matter the occasion we can help you and your guests have a fantastic time and give them something they'll talk about for weeks!